I live in San Diego just a few miles away from Tijuana. 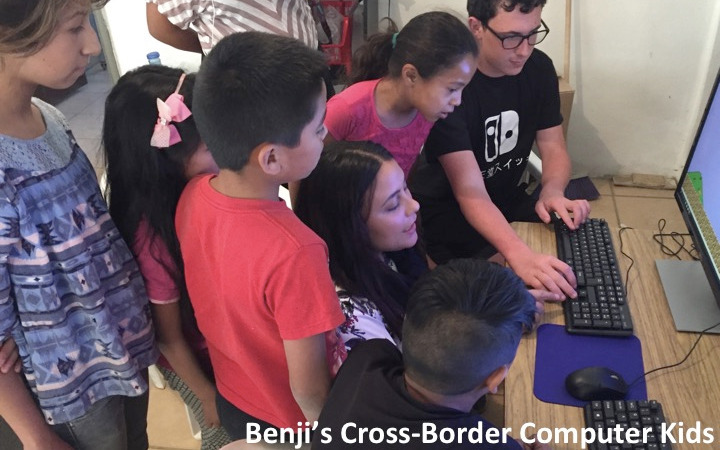 I want to share my love of computers with kids across the border who live in difficult conditions. I am working in the Laureles Canyon, an informal settlement (a slum) that has 85,000 people. It is just on the other side of the border-wall, but most people in San Diego do not know that it is there. It is a very poor part of Tijuana that has very limited water, electricity, and does not even have a high school. Organizacion de Colonos de la Divina Providencia is a very special community center located in the slum. They have water, electricity and internet, and provide meals and medical services to people who cannot afford them. I am working with them to start an after-school computer club for middle schoolers who do not have access to computers. The club will teach them computer skills, give them access to fun games, and will also provide them with a hot meal. I am raising money to buy 5 Dell computers and to pay instructors and youth mentors who can teach computer skills to the kids. And gaming! The computers will all be loaded with Minecraft. $4500 After-school Computer Club - 18 months of support for youth mentors and computer instructors. I hope you will support my cause and I appreciate every cent you donate. These computers will make a big difference in these kids' lives. I will give updates on our progress! Mazel Tov, looking forward to seeing you in Florida.